The Humane Society of Northeast Iowa helps abused, neglected, abandoned, and unwanted companion animals in the five-county area of Northeast Iowa. They have numerous services including dog and cat rescue, fostering and adoption services, and humane education. 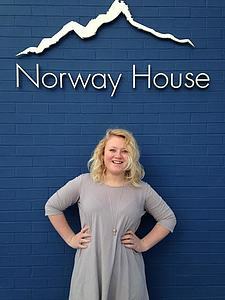 Solveig worked on weekly projects as the fundraising intern. She implemented fundraisers in elementary schools and researched grants that the humane society could apply for. She learned a lot about independent work and time management, as she did all of the work on her own on campus. 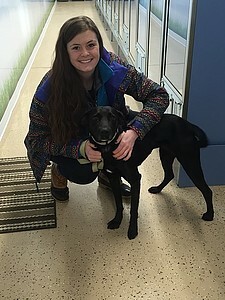 She volunteered at the shelter two days a week, which Solveig said was the most rewarding part of her internship because she knew that she helped someone other than herself that day. She was able to see how happy the people and the animals were when someone adopted them. The projects she worked on pertained to her management major because she learned a lot about researching and how non-profit companies are different than for-profit companies. 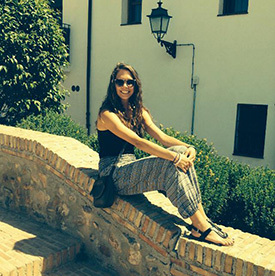 This internship solidified Solveig’s interest in working in the non-profit field after she graduates. NaviHealth provides post-acute care programs and management solutions that improve the quality of care during patients’ experiences. 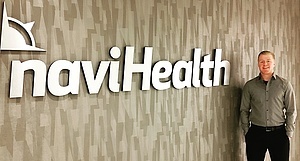 Gabe had the opportunity to intern at NaviHealth and gained valuable insight into the healthcare industry. He was able to work with people from many different areas of the business. He felt he was valuable to the NaviHealth corporation and the patients they were assisting in their recovery. Gabe is happy with his J-term experience because while he had fun, he also learned a lot and was able to help those in need! 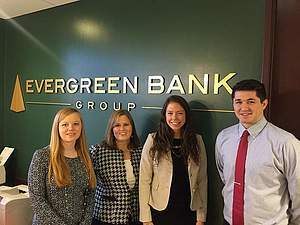 Evan interned for the Evergreen Bank Group in Chicago, IL. The CFO directly assigned him projects that allowed him to work with employees from different areas of the bank. He learned how to manage his time as well as communicate with coworkers. Evan enjoyed the experience of working in a city as large as Chicago and enjoyed getting to know his coworkers, who became his good friends. During his time, he learned the importance of connections and having a team that works well together. Evan also realized this is the type of work environment he wants to be involved with in the future. Open Decorah is a business that strengthens Decorah’s community by providing a co-working environment to work, gather, share, and learn. 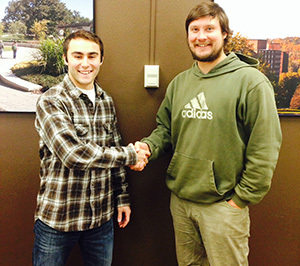 Matt gained new experience in sales, social media, and marketing. He found new ways to manage online websites, learned more about using blogs for marketing, learned how to build the brand through consistent messaging, and assisted in the development and implementation of systems to better serve clients. For him, the most rewarding part was to see the progress the company made as people joined and became interested while he was there. Matt discovered through this J-term that if he applies himself, he can accomplish any task at hand! Gundersen Health System’s sustainability program, Envision, establishes and strengthens sustainability projects that can help lower organization costs and improve the health of communities. Past projects include innovative recycling and waste management systems along with programs to launch partnerships for renewable energy projects. At Gundersen's location in La Crosse, Wisconsin, Brian worked in the Business Operations department and shadowed the Sustainability, Project Management, Facility Operations, and Construction Engineering areas to learn more about their sustainability efforts. Brian developed skills that are useful in the healthcare administration field including exposure to production charts and trends, process improvement measures, value analysis, and leadership techniques. 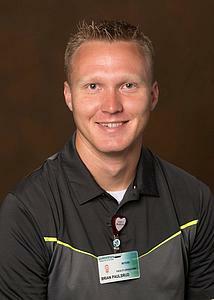 Brian appreciated building relationships with the leaders and managers within Gundersen’s organization. 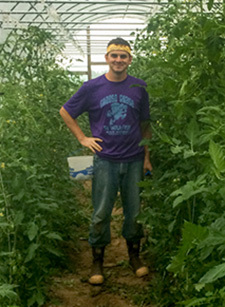 He learned several skills in his classes at Luther that he was able to use at his internship such as using Microsoft Excel, financial management equations, and managerial techniques. 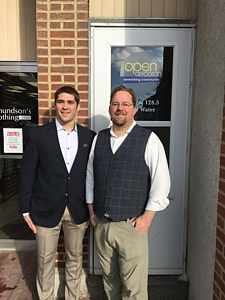 Overall, Brian’s internship led him to appreciate and understand the fast-paced environment of the healthcare industry and the care Gundersen has for the patients and communities they serve. 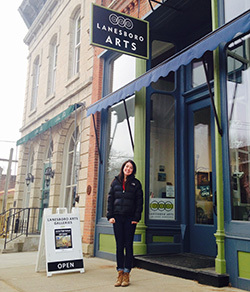 This January, Erika had the opportunity to work at Happy Llama in Lakewood, Colorado. 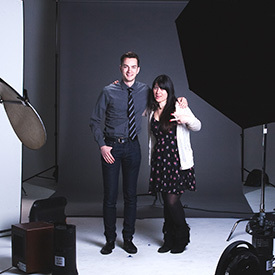 The company is a professional print and merchandise business that frequently partners with events and festivals in Denver to ensure their success through printed collateral. 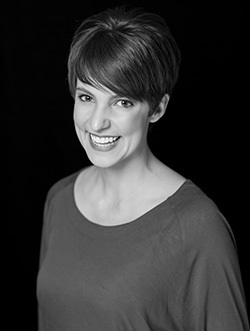 During her internship, Erika was in charge of developing a social media campaign for the business, helping re-format the entire website, initiating a hiring process, weighing in on Happy Llama events, researching market trends, and acting as a committee chair to the Mile High Young Professionals group. 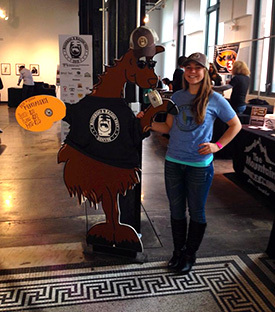 She really enjoyed managing the merchandise and seeing the end result of immense planning during the Bacon and Bourbon Festival in downtown Denver. Erika feels this internship has helped her reflect upon what she would like out of a job after graduation and taught her to balance work with personal goals. Evergreen Bank Group Headquarters is located in Evergreen Park, IL and acts as a community bank for its customers, while providing the security and resources of a national financial institution. Since the company has less than 100 total employees, there is a palpable sense of family in the workplace. 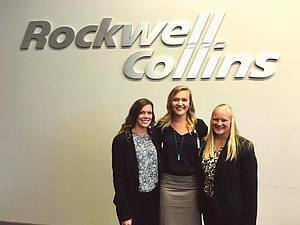 Kayla had the opportunity to shadow the head of Human Resources, Jenny Voss, and work with the CFO, Jill, who are both sisters and Luther alumni. At Evergreen, Kayla’s tasks varied daily but she spent much of her time with employee insurance plans, taking a yearly audit of personnel information, and preparing worksheets and summaries for the Board of Directors meetings. She even had the opportunity to start and finish the 2014 Total Compensation Statements for all employees, reflecting how much they received from the bank in terms of wages, overtime, bonuses, and all types of insurance and taxes the bank contributes to, by making very individualized and detailed graphs and values. 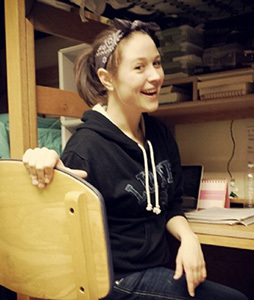 Overall, Kayla loved her internship and could easily see herself working at Evergreen. She is currently looking for jobs in the HR field and banking because of her experience. Orgel Wealth Management (OWM) is a wealth management company that invests with mutual funds, helps clients build diverse portfolios, and provides financial planning guidance. Bethany spent a lot of her time shadowing and working with the partners of company, but also was given a project to work on from start to finish. OWM had an inadequate system in place for the music listened to by clients while on hold, so Bethany got to search for a company to hire, allowing her to make a variety of business decisions and build professional communication skills. She even presented all of her suggestions in packets to the partners of OWM to finish off the project. Working at OWM helped Bethany realize she was less interested in becoming a Chartered Financial Analyst (CFA) and felt that working as a Certified Financial Planner (CFP) was a better fit because she enjoyed helping people discover what assets they have and how to plan for their financial goals in life. Spending the month with OWM helped Bethany learn a lot about herself made her realize she is more people-oriented than she previously thought. Kinderhaus is a Waldorf-inspired, outdoor kindergarten and preschool in Decorah. 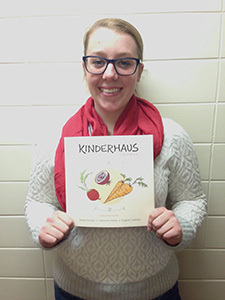 As the Project Manager of the Kinderhaus Cookbook, Meg is responsible for creating a cookbook full of recipes collected from families and community members. She’s spent much of her internship editing, revising, and formatting recipes, contacting artists for illustrations, and working with the publisher. 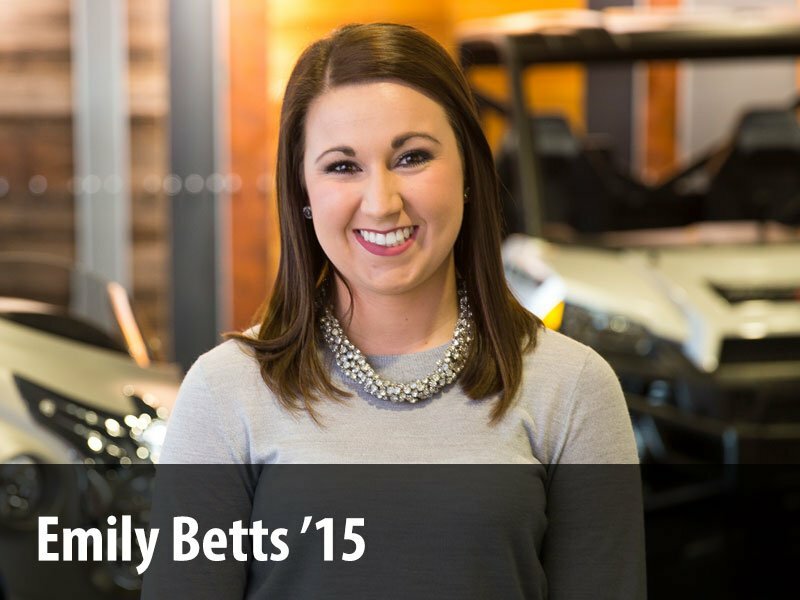 Meg’s experience helped her realize the many areas within management that can be pursued. She hadn’t considered project management as a career before, but after having a small taste of what it entails, Meg thinks it could be a possibility for her future. Once her internship is over, Meg is excited to hold a hard-copy of the cookbook and see the impact of her hard work. 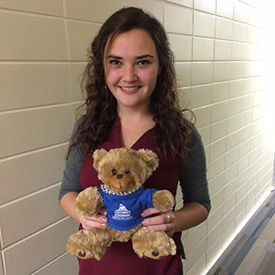 After her internship with Kinderhaus, Meg was referred to GoodBlogs in Decorah and hired as a Conversion Manager, which is primarily comprised of two tasks. The first deals with collecting marketing strategy data, analyzing it, and sharing it with the affiliated companies. The second uses split testing to find effective marketing strategies and discover additional leads. Meg feels her internship helped prepare her for this position because of the network she made with community members leading her to the job, and the increased creativity she gained by working with various people and different perspectives. Economics, Accounting, and Management maintained by huintr01. Page last updated on 6 November 2017.